Team Telefónica held off a fierce challenge from PUMA to win the Sanya Haitang Bay In-Port Race on Saturday and extend their overall lead to 18 points before the start of Leg 4 to Auckland. Telefónica went into the race under some pressure after a last minute change of rigging and with two poor performances in the three previous in-port races. But a smart decision to drive hard right off the start line took them clear of the fleet and despite the relentless challenge of PUMA Ocean Racing powered by BERG they went on to seal another valuable win. Abu Dhabi Ocean Racing took the third podium place. It was the second victory in four in-port races for Iker Martínez’s men, who have also won all three offshore legs. CAMPER with Emirates Team New Zealand, their closest challengers in the overall standings, fought their way back up from sixth to fourth but it was a disappointing day for Chris Nicholson’s team, who lost another three points to the leaders. "Today the tactics were what made the difference," said Telefónica skipper Iker Martínez. "We were really in the right place for the upwind legs and the first downwind too. Even if we weren’t great at manoeuvres, we were in the right place and that’s what mattered." PUMA skipper Ken Read was also satisfied with a performance that meant Telefónica could never quite be comfortable. "We are pleased," said Read. "I think we did a really good job of it today. In a fleet like this we’ll take second every day of the week." 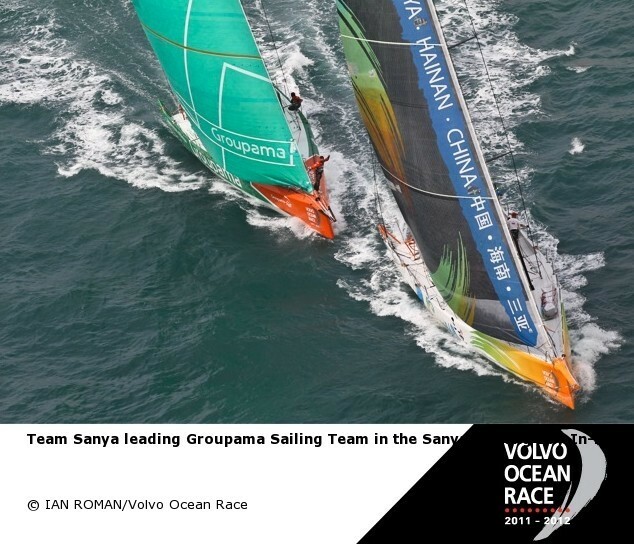 Mike Sanderson’s hometown heroes on Team Sanya fought an incredible battle but were just edged into sixth by Franck Cammas’ Groupama sailing team. Flat waters and winds gusting up to 20 knots provided perfect conditions for the fourth in-port race of the 2011-12 edition, allowing the teams to put on a spectacular show for the thousands of spectators who turned out to watch the action over a fast 10.8 nautical mile course. Telefónica took the lead early, rounding the first mark with a 28-second lead over their rivals before a slow rounding at the second mark saw Ken Read’s PUMA close the gap to just three seconds. For a while it was neck and neck and PUMA appeared set to pounce but Telefónica’s superior speed saw them pull away and such was their dominance they were able to sail conservatively over the closing stages to ensure the win by a margin of 41 seconds. Abu Dhabi Ocean Racing were four minutes and 20 seconds behind the leaders with CAMPER trailing by five minutes and 35 seconds. The overall rankings remain unchanged. Telefónica now lead with 101 points, followed by CAMPER with Emirates Team New Zealand on 83 and Groupama sailing team on 73. PUMA Ocean Racing powered by BERG have 53, followed by Abu Dhabi on 43 and Team Sanya on 17. Sunday sees the start of the 5,220 nautical mile Leg 4 from Sanya to Auckland at 1400 local time (0600 UTC). The leg start will be streamed live at www.volvooceanrace.com and www.livestream.com/volvooceanrace. Coverage will start 15 minutes prior to the race start.